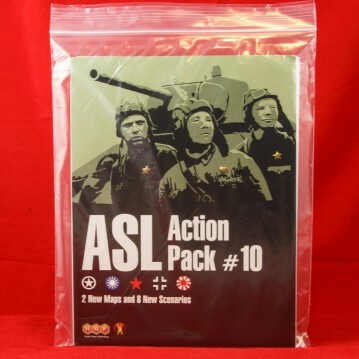 The 10th Action Pack debuted in November 2014, some 14 years after the first. Fourteen years is not a round number, but 10 packs certainly is, which gives us an excuse not only to examine Action Pack #10, but to look at the Action Pack series to date as a whole. 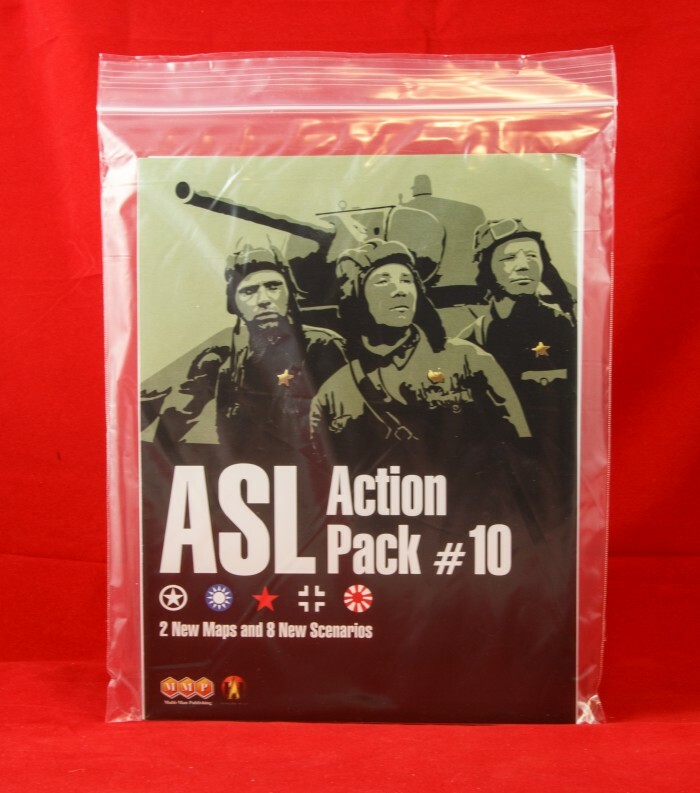 Though the first Action Pack was published by Avalon Hill, it is possible to think of this series as MMP’s baby, as MMP by that time was already creating ASL material for Avalon Hill and soon (with the Hill’s demise) would take over the series completely. Action Packs 1 and 2 both came out in the 1990s, each offering 2 new geoboards and 8 scenarios. In each, the scenarios were an unthemed mix. Following these two Packs came, well, nothing, at least for a long time. It was not until 2007 that the Action Pack series was revived, although even then it was not totally back in the game. Action Pack 3: Few Returned did not contain any new geoboards–rather, it contained reprints of the boards that originally appeared in Action Pack 1, but which were long out of print and unavailable. Moreover, the scenarios were not a miscellany but rather had a very specific theme to them. It was the fourth Action Pack that truly marked a return to form. Though it, too, had a theme (Normandy 1944), it now contained new geoboards, as would every subsequent Action Pack (2-3 boards each). Some subsequent Action Packs had themed, while others–such as this latest one–did not. Action Pack 6 even introduced a new style of geoboard, providing a bit of innovation and variety. Generally speaking, themed Action Packs tended to feature the work of a single designer, while unthemed action packs did not. The Action Packs have not always been equally good, but overall they have maintained a generally high level of quality, with some classic and a number of solid scenarios to their credit. Perhaps more importantly, in the long run, they revived the long-stalled publication of new geoboards after a gap of many years. Thus they allowed the creation not only of the scenarios that accompanied each pack, but also a whole host of subsequent official and unofficial scenarios utilizing the new boards. This may be the most important contribution or legacy of the Action Pack series. One certainly hopes that the series will continue. Action Pack #10 (AP10) contains only 8 scenarios, which is a tad disappointing (Action Packs #3-#9 all contained either 10 or 12 scenarios each), as well as two geoboards (69 and 70). The geoboards seemed designed to work together, though they are fully geomorphic on all four sides. Together, the upper halves form a small crossroads hamlet, surrounded by some small fields. 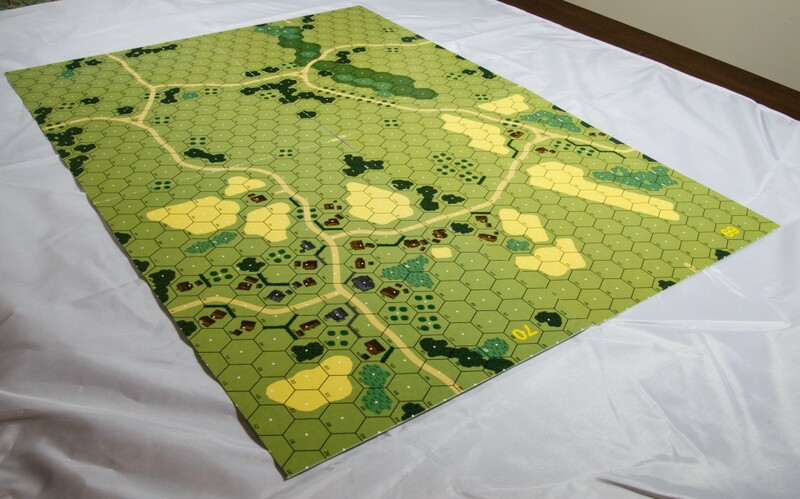 Interestingly, the bottom halves depict an extremely open stretch of terrain, with no buildings, hedges, or other manmade objects (other than the roads), which renders these boards suitable for wilderness scenarios. As has generally been the case in recent years, the artwork is crisp and nicely done. 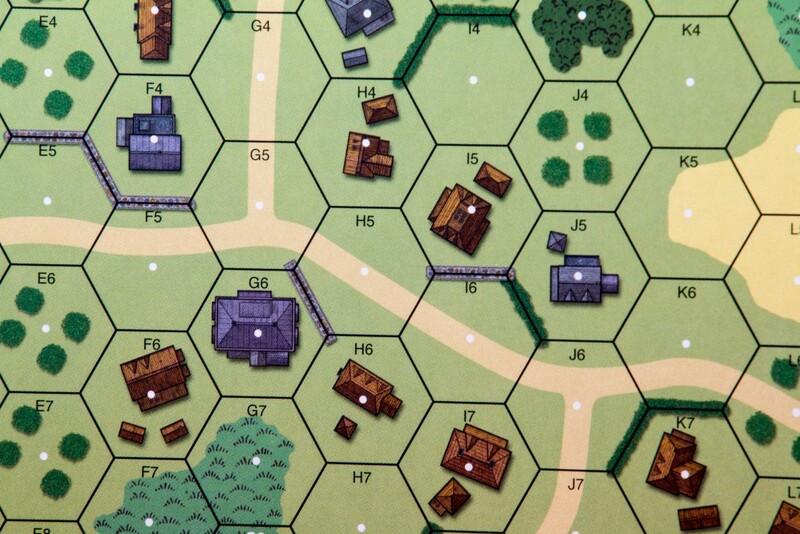 There is nothing striking about these boards, nor do they fill an obvious gap, so they may not interest scenario designers as much, except for those always searching for a “fresh” village or town. Though it is not clear if they were designed to do so, the boards can also mate through the Q hexrow. Most of the scenarios (5 of 8) are East Front actions, taking place in the Soviet Union in 1941, 1943 , and 1944, as well as Hungary in 1944. All of these feature Soviets vs. Germans, except for AP96 (Food Fight), which features Soviet partisans fighting Ukrainian partisans. 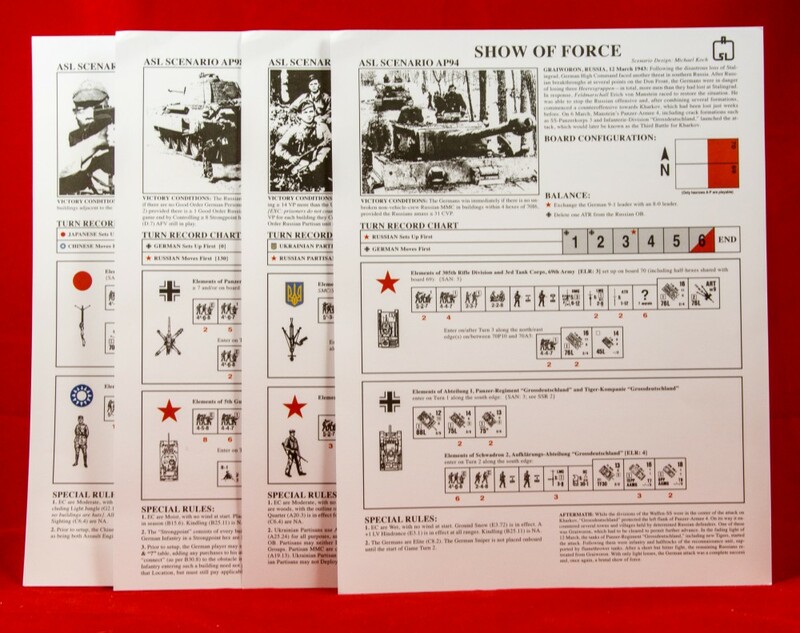 One scenario is set in France in 1944, pitting Americans against Germans, while a second scenario features the same combatants fighting in Belgium during the Battle of the Bulge. A single scenario, featuring the Chinese and Japanese in Burma, represents the PTO. Each of these scenarios uses Board 69 (6) or Board 70 (5). In addition, Boards 6, 38, 54, 57, 62, 67, and ASLSK board s are used. About half the scenarios are medium in size, with a couple smaller and a couple larger actions thrown in. The majority are more or less tournament playable. One scenario uses the Night rules; no scenarios use OBA or Air Support. A number of the scenarios are interesting. AP93 (Best Think Again) is a nice medium-sized scenario featuring a Soviet attack supported by 4 KV tanks. The defending Germans will have their hands full (full of explosives, that is) trying to stop the metal monsters. AP98 (Last Laurels) depicts a Soviet attack and German counterattack with both sides having some nasty weapons. 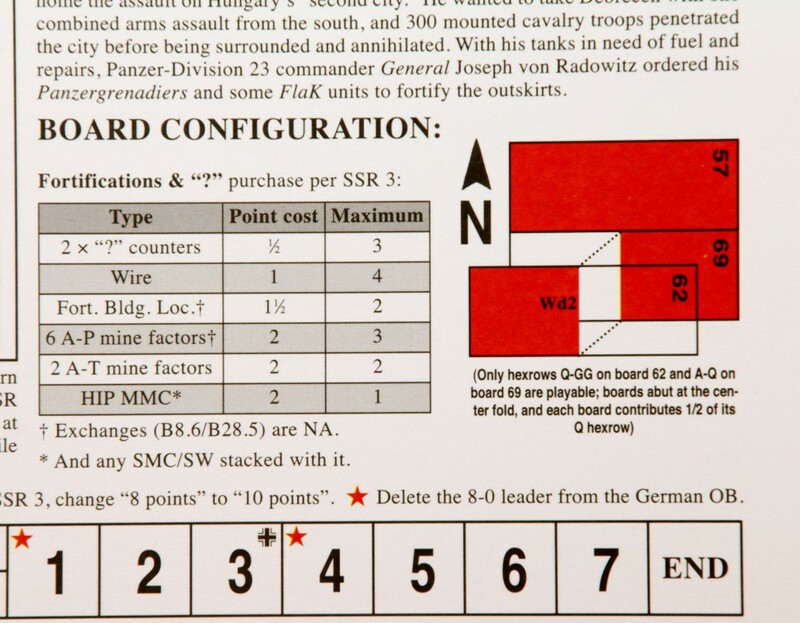 The Germans may also purchase some help from a Fortifications Table. 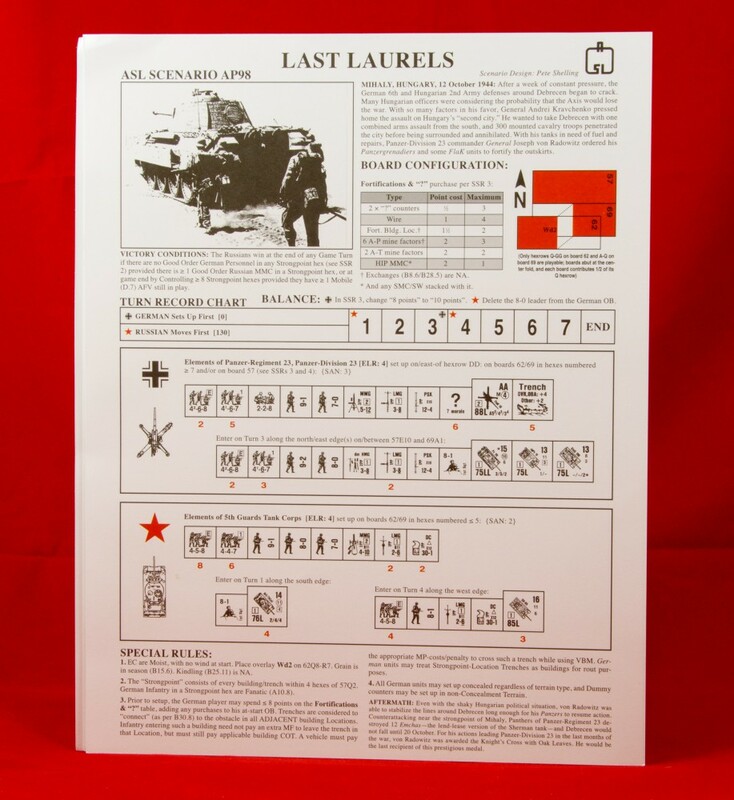 AP95 (Operation Kutuzov) also features a Fortifications table for the Germans. 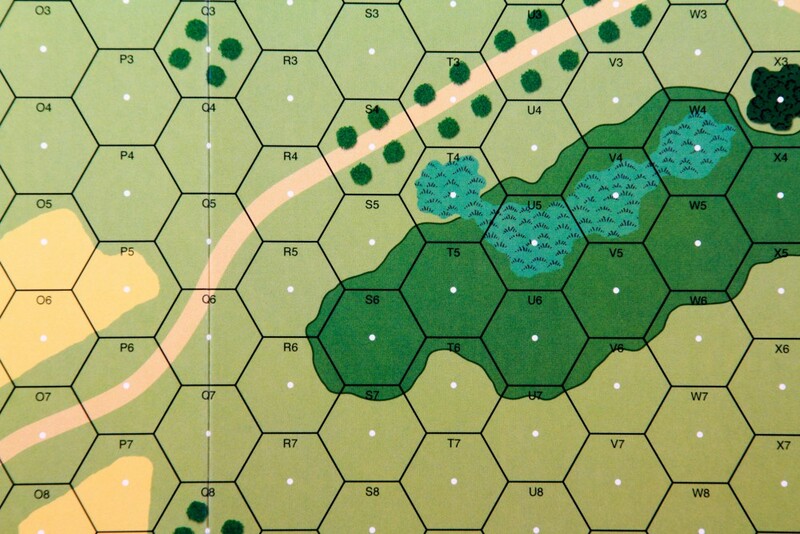 This scenario depicts a Soviet attack at Kursk; naturally, armor plays a large role here. Action Pack #10 is a modest product, with two okay boards and smaller-than-normal set of scenarios, but the scenarios look pretty decent and the price is right, so there is no reason for an ASLer not to get this product.